Abandon Ship is a 4-player minigame featured in Mario Party 2. Its name comes from the term "abandon ship", meaning to evacuate the ship immediately, which is fitting as the game is centered around trying to escape from a sinking ship. In this minigame, the four characters are on a large ship that crashes into a boulder, causing it to start sinking. Quickly, the players must climb the masts to get to the top of the ship. Climbing is performed by repeatedly tapping . Sometimes, giant Cheep Cheeps jump out of the water and try to hit the characters, which stuns them and pushes them down the pole. At the same time, the ship is constantly sinking into the water. Players can fall in the water if they are not climbing fast enough, which results in them losing the game and being carried away by a Blooper. 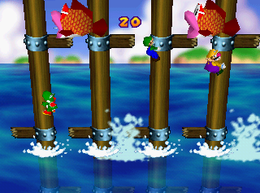 Players have to move left and right to avoid wooden bars on the mast, and coins can be collected this way. The first player to reach the top of their mast wins the minigame. In the Mini-Game Coaster, the human player must be the first to reach the top of their mast to win. Game Rules – "Quickly climb to the top of the mast before the ship sinks beneath the sea." Advice – "If you get hit by the jumping Cheep-cheeps, you'll be stopped for a moment, so beware!" French Tous à la mer! All to the sea! German Alle Mann von Bord! All Men off Board! This minigame was once shown in a commercial for Fruit by the Foot. This page was last edited on January 29, 2019, at 21:09.